It's action station here at the Opera Point Marquee as we set up for the 2010 Ultimate Wedding Planning Party! 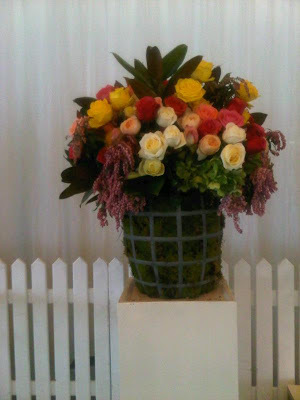 Look at this beautiful floral arrangement by Mandalay Flowers! The bridal fashion show features the stunning 2010 collection by Steven Khalil plus bridesmaids & bridal gowns by Amsale for Angela Wilson. The fashion show starts at 1pm sharp for the lunchtime session! The gala evening session will also feature the bridal show plus you will hear insider tips from the pinnacle of the Australian wedding industry.. including Sarah Gawthorne (editor of Bride To Be magazine), Paris Cutler (Planet Cake), Anthony Del Col (Staging Connections), Mark Baulderstone (MD of Riedel), Graham Monroe (GM Photographics), Abraham Joffe (Abraham Joffe Videography) & Amy Erbacher (Amy Erbacher Beauty). The gala session begins at 6pm! We also have five amazing lucky door prizes - REMEMBER, you have to be in it to win it!! Tomorrow it's lights, camera, and... ACTION!